There are many classic sandwiches featuring peanut butter. One that I never heard of until I moved to Canada is the peanut butter banana sandwich. It never occured to me to put sliced fruit between two slices of bread but the first time I ate one, I was immediately hooked. I don't eat it much anymore but it's not because I'm all grown up. Somewhere along the way, sandwich faded away from my menu when brown bag lunch at the school cafeteria made way for a piece of fruit to munch in front of the computer. The good folks at America's Test Kitchen and Cook's Country publish free recipes online every now and then. When I saw they posted the recipe for Deluxe Peanut Butter and Banana Chocolate Chips Cookies, I had to smile. That's the ultimate cookie with every single one of my favourite flavours crammed into one! 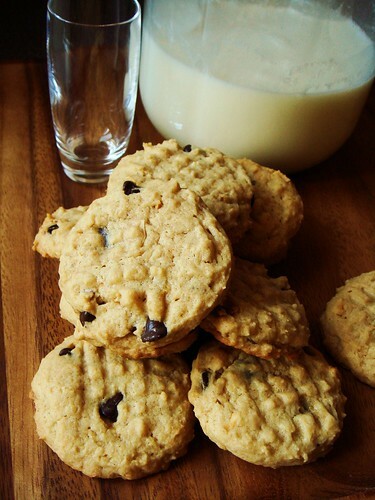 This soft cakey cookies is enriched with cream cheese and peanut butter. It even has the signature criss cross pattern of classic peanut butter cookies! The batter contains mashed bananas but they boosted the banana quotient with crushed banana chips to pair with the dark chocolate chips. Can you say mouthwatering? I stayed true to the recipe because all the recipes coming out of America's Test Kitchen have been exhaustively fine tuned in their search for perfection. Of course I want to know what the cookies are like as envisioned by the author. The only change I made was using smooth peanut butter instead of crunchy. I supplemented with roasted chopped peanuts to emulate. I adore this cookie and it delivers on its promise of deluxe. The cookies are of diminuitive size compared to most drop cookies but they look so absolutely adorable. Sensible sizes if you ask me because they are rich indeed. You can't have cookies without milk, right? A cookie this special calls for special drink pairing. I served them with tall glasses of cold raw milk, well-shaken to combine the cream. I'm sharing these delectable treats with my inline skating teammates during our training camp this week. There are plenty of tough workouts in the plans and I'm sure this is a small reward we can all look forward to. One of my 2011 resolutions is to have monthly family pizza night to practice my pizza making skills. For many people, new year resolutions have fallen off the radar now that a quarter of the year has come and gone. I find it almost unbelievable that this new ritual is taking hold at my house. There were hiccups of course and I discovered in February the worst thing I can say to a guy is “Change of plan. We’re not having pizza tonight” (right up there with “We’re out of beer.”). Last weekend, Little Brother and I enjoyed a dinner of pan pizza topped with homemade tomato sauce, mozzarella, turkey sausage, pancetta, and crimini mushroom. What a fantastic use of my 10-inch cast iron skillet! The pizza reminded us of those thick crust Pizza Hut pan pizza we used to love when we were kids. Confession time. I cheated this month and used premade pizza dough from Whole Foods. They are well made (even the guys at Serious Eats said so) and tastes good. But pan pizza is not what I want to write about today. Yesterday, I surveyed my fridge and the leftover pizza dough, sauce, and hand shredded cheese started mocking me. You see, I like to keep my fridge really neat and leftover ingredient is not part of that picture. Logical choice would be to make a second pizza but who wants to make the same thing back to back? Cue stromboli. What’s with the fancy name? 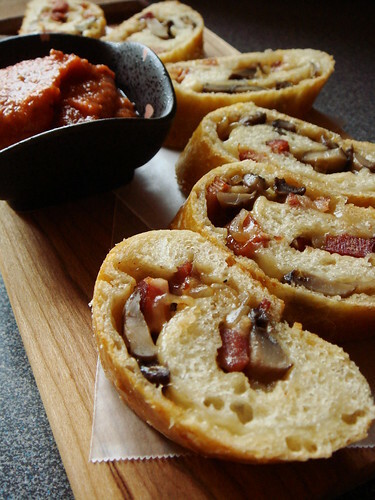 It is just pizza roll but calling it stromboli with some Italian-American fanfare is so much more fun. I filled the pinwheel with sautéed pancetta, shallots, crimini mushrooms, and mozzarella cheese. Once the log bakes to golden perfection, you let it sit just long enough so it’s cool enough to handle. Slice on a bias to reveal the pretty filling and serve with marinara sauce for dipping. Does it not remind you a bit of sushi rolls when I plate it on a rectangular wooden tray with a small Japanese sauce dish? 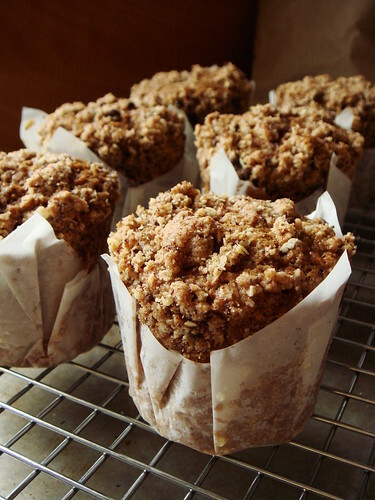 I love it when I come across recipes so inspiring that I cannot wait to rush to my kitchen and start baking. Lately, I’ve been enjoying a string of such recipes so the excitement keeps me invigorated. One of food52’s latest challenge is the search for late winter pies and tarts. In addition to their usual prizes and inclusion in the cookbook, the winner of this challenge also gets featured on Martha Stewart to cross promote her latest cookbook Martha Stewart’s New Pies & Tarts. Upon reading the winning recipe Tangerine & Almond Shortbread Tart by Lori Goldsby, I made a beeline to the supermarket to pick up a couple of tangerines that very same day. 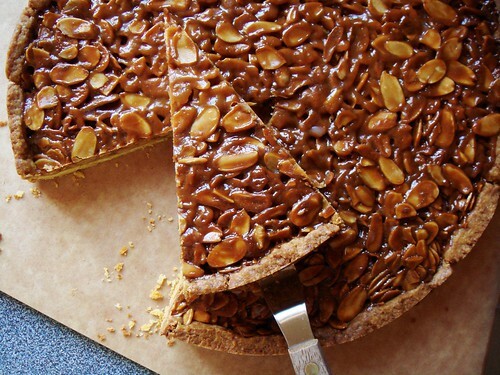 This tart is simple yet unusual. A shortbread crust filled with caramel and toasted almond slices evoke memories of florentine but it is the use of tangerine that intrigues the tastebuds. You can obviously detect the refreshing taste of citrus in both the crust and filling yet the taste is elusive to pinpoint because tangerine rarely gets enough attention. When I was zesting and juicing the fruit, I was overcome by the bright sunny taste and vibrancy of tangerine. The caramel filling made with honey, brown & white sugar, tangerine juice, and cream developed a deep flavour to temper the sweetness. I can imagine how awesome it would be if I top the tart with a thin glaze of tangerine dark chocolate ganache. If only I had the time to complete my vision! A mediocre lemon bar is one-dimensionally sweet. A good lemon bar is tart, tempered by just enough sweetness to remind you it’s dessert. What kind of lemon bar would it be if there’s a mix of sweet, tart, and bitter? Apparently, it is not for everyone but those who like it, like it a lot. A standard lemon bar recipe typically calls for making a lemon curd that sets after baking in the oven. The flavour of lemon curd comes from the use of zest and juice. Silky smoothness is prized above all. Then there is a whole other family of lemon bar/tart/pie that uses every bit of the fruit except for the seeds. Have you heard of Shaker Lemon Pie? How about Whole Lemon Tart? I am once again on a quest to empty my fridge of perishables so that bag of organic lemon became a convenient excuse to make David Lebovitz’s streamlined Whole Lemon Bar. If you compare this recipe side by side with Rollet-Pradier’s Whole Lemon Tart, you would soon notice the similarities. Whole lemons are cut to pieces and pureed with eggs, sugar, cornstarch, and butter. The rind of the fruit adds a slightly bitter edge that I personally don’t care for when I taste the fruit filling by itself. But here’s the brilliant part. Once paired with the rich buttery shortbread base, the taste comes alive. 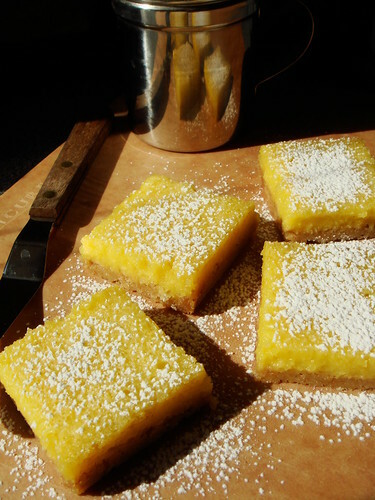 I adore the balance of flavour that makes these lemon bar that much more lemony. It is not a dessert flavoured with lemon. It is lemon presented as dessert. This winter I had the opportunity to experiment with many different citrus fruit. Despite living in a country where citrus doesn’t grow, there are plenty of different varieties that made their way up north. I used to feel torn about enjoying citrus in my attempt to eat local. I have since made peace with myself to allow for produce that doesn’t thrive locally as a treat. However, whenever I read about other bloggers step into their backyard to pluck a few rare breed of orange for a recipe, I can’t help but feel just a little jealous. Granted, it’s not like I go to my own backyard for apples or peaches because of my pathetic gardening skills. The notion is so romantic though that I can only hope one day I can do the same. Better yet, I’ll just marry someone in California with a green thumb and a yard. Problem solved. Crème caramel is one of my all time favourite dessert that embodies simplicity. At its core, this is a baked custard made with milk, eggs, and sugar with a caramel sauce. It is a versatile canvas that welcomes other flavours ranging from the classic vanilla or coffee to the more exotic lavender or lemongrass. No doubt these flavoured version are tasty in their own way but what if I focus on milk, eggs, and sugar instead? With the confluence of several lucky coincidence, I came into possession of raw milk, farm fresh duck and chicken eggs, and a huge block of maple cream. Every ingredient is of such high quality that it can elevate a dessert all on its own. When they join forces to create a batch of extra special crème caramel, all I can say is that I’m not sharing any outside of my house. 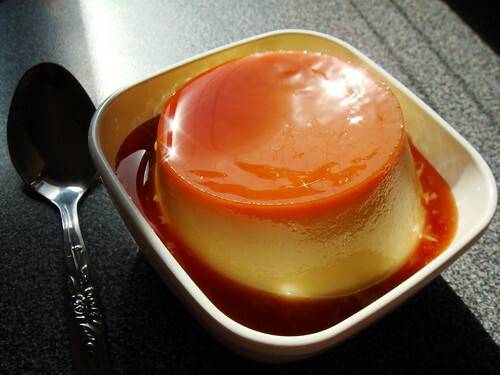 Words cannot describe the perfection of this flan. There is barely enough structural integrity for the pudding to stand on its own once unmolded. Each spoonful trembles in front of my eyes before melting on my tongue into smooth creaminess. The slightly bitter undertone of the caramel highlights the maple sweetness of the custard. Oh and the eggs! And milk! This flan is a celebration of all that is tasty about our farm-fresh goodies. When Around My French Table arrived at my doorstep, one of the first recipes that caught my attention was Chestnut Pear Soup. I love chestnuts, especially roasted over coals and redolent with smokiness. As for pears, its ability to take on other flavours without letting the inherent “pearness” getting lost in the shuffle makes it one of the most versatile fall/winter fruit. 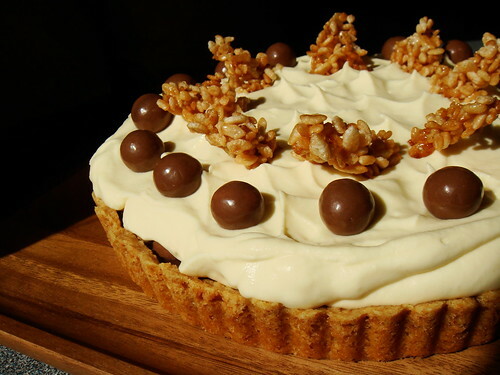 Chestnut and pear make for a classic duo and their mild flavours mean they adapt just as well for sweet or savoury application. 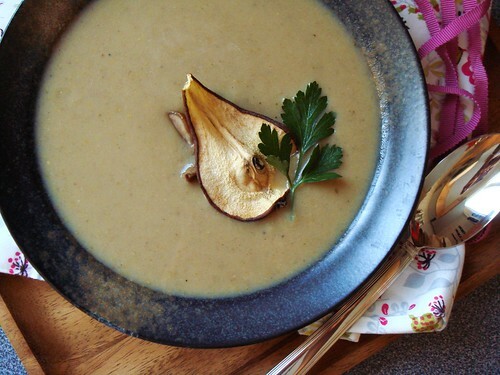 First off, let’s take a look at Greenspan’s Chestnut Pear Soup. This pureed soup of chestnuts and bosc pears is built upon a base of onions, leeks, celeries, and thyme. I stayed true to the vegetarian roots and used my vegetable bouillon instead of chicken stock. I cannot say I miss the chicken stock nor cream at all. The starchiness of chestnuts gave this soup plenty of body and an earthy taste. Meanwhile, even though there were only two pears in the soup, the honey sweetness weaved its way between the other more savoury ingredients to create a harmonious flavour in every sip. The smoothness can be yay or nay depending on personal taste. Those who like velvety creamless soup probably would enjoy it very much while those in the other camp can find it a little like baby food. My suggestion is to garnish the soup with whole or large pieces of roasted chestnuts. The chunkiness adds a bit of textural variation but it doesn’t obscure the flavour profile of the soup. I also like to float a piece of oven-dried pear to add visual interest. 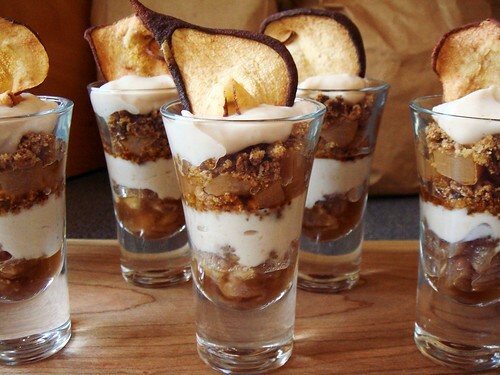 The dried pears are not crisp nor crunchy since they are simply dehydrated in the oven overnight at low heat. The slight chew and concentration of sweetness are addictive. I love to dip them in the soup. The Chestnut Pear Soup tastes unmistakably autumnal so I’m quite glad that I got around to make it when Mother Nature took a detour from her march to spring with snow and a cold blast. Banana bread is one of the most basic recipes one can make at home, regardless of your baking abilities. I have tried my fair share of recipes too yet I don’t have a favourite that I return to again and again. Every time I have a few bananas sitting on the counter turning spotty, it is another opportunity to try a different recipe. 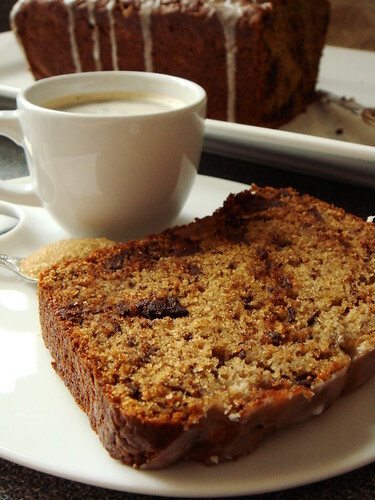 Banana bread is mostly a mean to rid of over-ripen fruit that are simply not that great to eat out of hand. 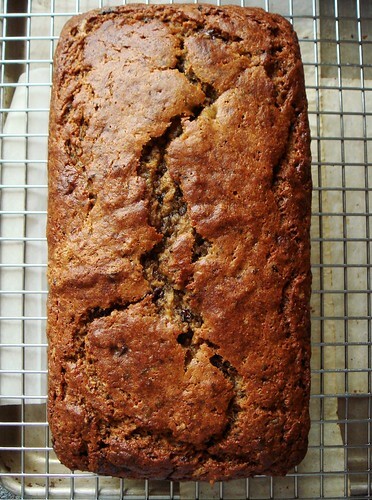 Oddly enough, when Melissa Clark posted her recipe for Lemony Olive Oil Banana Bread with Chocolate Chips for her upcoming cookbook, I wanted to make this so much that I actually intentionally set aside bananas to ripen. I’ve had very good experience with all her recipes in the past and that kind of confidence inspired me to find out her take on this classic. Which qualities I look for in a good banana bread? Obviously banana flavour ought to dominate yet there should be other supporting flavours to make it interesting. Texture should be moist and tender but not greasy. I like the ease of using oil instead of melting butter but I do not want the flavour or texture to suffer. The recipe should ideally follow the classic quickbread mixing method so I can make it at a moment’s notice without devoting hours of undivided attention. This recipe embodies all of these qualities and more. No wonder I was eager to give it a try. Vegetarian dishes are major part of my daily diet. Of course I enjoy most of them, otherwise it would be rather sad. Yet, when I encounter preparations that make me excited about the dish, it can be a real treat. The two excellent cookbooks by Ottolenghi are packed with such exciting vegetarian dishes. I bought both books before the avalanche of awards made them one of the top sellers in North America. So now that I look at the much reduced price, I secretly wish I waited. However, the joy they’ve given me in the kitchen and on my dinner table is undeniable. Honestly, I’ve been using both books since day one anyway so I can’t really complain much about the price. I’m making good progress on reducing that pile of carrots in my fridge. After yesterday’s Itty Bitty Carrot Cake Cookies, I want something savoury and spicy. 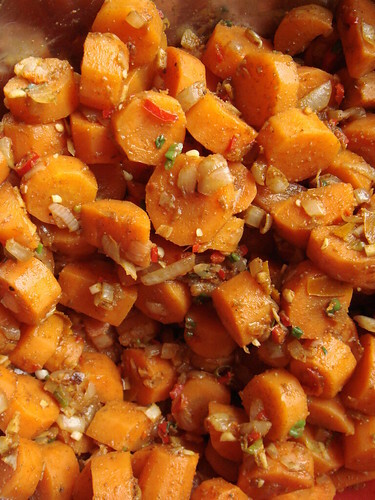 The Spicy Moroccan Carrot Salad in Ottolenghi’s Plenty was exactly what I was looking for. Exactly how exciting can blanched carrots be? Well, once you toss it with caramelized onion, green onion, garlic, red chili pepper, cilantro, cumin, allspice, cinnamon, ginger, coriander, paprika, and white wine vinegar, blending in the background is simply unthinkable. The flavour from the complex mix of spices filled my kitchen with exotic smell of a land far away. This salad is wonderful either warm or cold but the dollop of Greek yogurt is essential. 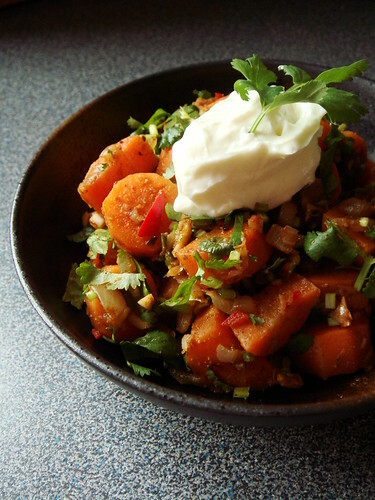 It tames the heat from the spiciness of the dish and adds a nice creamy counterpoint to the toothsome carrots. Vegetarian dishes like this makes me want to march up to my friends with a tasting spoon in hand so that they can share my excitement too. My oven had not been its usual reliable self lately. The sound of gas sputtering when the oven slowly heated up was particularly disturbing. Seeing the important role my oven plays in my cooking and baking, I finally stop my procrastination. For a brief minute, I was looking longingly at the shiny gas range from the Viking catalogue. Obviously purchasing a new major appliance is out of my budget for the time being but a girl can dream, right? I even got an open invitation from a friend to cook at his kitchen so I can test drive a Viking range. It almost pains me to think that his range is not being used to its full potential (yes, the oven is a popular storage space for many Asian households). This morning, a visit from the Maytag repairman made my world just a little better. He quickly diagnosed the problem with the ignition part of the oven and informed me that the average lifespan of this part is typically 4-7 years. It would seem mine of over 12 years of service fared better than average. The cost of repair is a bit expensive but it is still significantly cheaper than purchasing a new (however shiny and pretty) cooking range. Besides, now that my oven returns to smooth working order, I have no qualms about baking bread or pizza anymore. My monthly pizza night awaits. Want to see other stuff I made from the Ottolenghi cookbooks? I highly recommend each and every one of them!